Annie Jaffrey: Healthy Pasta Sauce Recipe! I love sprinkling some pumpkin and flax seeds on top! thanks, definitely going to try this out! Love the recipe idea, I will defiantly be trying this soon. I wanted to share my healthy lifestyle blog with everyone. Go check it out at www.alwaysfitgirl.blogspot.com and let me know what you know! Mmm, thank you so much for sharing these recipe and yes, it would be good to see more videos about healthy food and healthy lifestyle^_^ Thank you, loved this video! You should check out Fullyrawkristina she has a youtube channel and has been a fully raw vegan for like 10 years or something ..with TONS of recipes and AMAZING tips about going fully raw which you should read as it is important to get lots of facts before going fully raw. I'm so excited! I'm a vegan for 2 months and this journey is really amazing. I'm not 100% raw, cause I try raw till 4 diet (30 bananas a day by FreeLee). Thanks for sharing with us this recipe. I love to watch your videos cause you're such an amaaaaaazing and lovely person. You are a reaaaaallyyyy big inspiration to me!!! Thank you for everything and sorry for my english. Kisses! I made this sauce today, tastes soooo good! I ate it with the bread, like bruschetta.Thank you for this wonderful and easy recipe:) Would live to see more videos like that. Great recipe!! i want to try it!! thank you for sharing!!!! Annie, you look so good these days! There has to be huge advantage being raw! 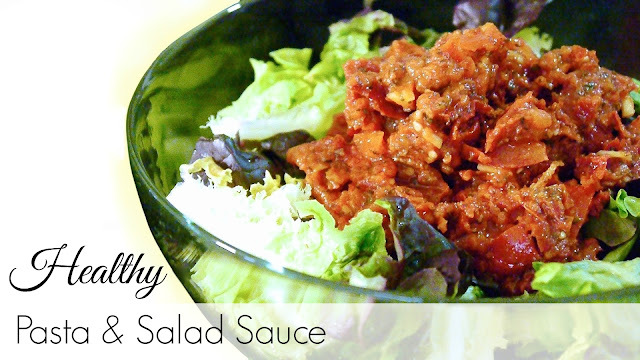 This recipe seems super easy, and perfect on top of salad as well! I will try it for sure! Hi Annie, Thanks for this video. Still beautiful !! I've always seen that flax seeds have to be mixed before eating them. If not, you will not get all the benefits. I'm French and I can't explain it to you very well but you will surely find informations on the internet. I've also watched your last video and I hope you to get a good health very soon. I don't eat always raw (i cook) but i eat vegan and gluten free since a time and i've seen the same results as you : skin is better, health is better (no sick during all this winter ! alhamdulilah), more energy, etc. Recently, i've ate some gluten (very very few) and most of my health problems went back !! Hope you will find what makes YOU sick and get well very soon. Have a nice day !! I made this for dinner tonight and it was absolutely DELICIOUS! Thank's for sharing Annie! Hope to see more raw recipes on your blog/channel. I love that you're channel promotes a healthy lifestyle. Beijos e abraços! If you want to go fully raw, you should keep it at 80/10/10 and ban any kind of OIL and SALT. Also, garlic and onions are not recommended (neurotoxins). Best of lucks!